"I'd pick ice in the moooorrrning. I'd pick ice in the evening! All over this land!" Oh wait, I do have an ice pick. And a hammer. And a table saw and all kinds of stuff to fix stuff. Well, The-Guy-Who-Knows-A-Song-About-A-Chicken does. I was totally KIDDING on the devil worship thing. But I did promise Halloween photos. 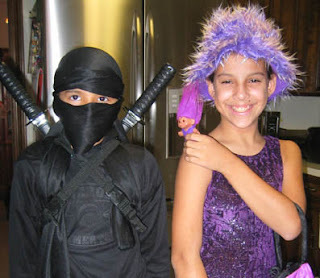 So here's my boy the ninja and my gal the troll: Here's our first pumpkin. My gal carved it vomiting, of course. Because we want to make sure the new neighbors all know we're the friendly type. The only problem was, even in this picture the poor guy was rotting in addition to vomiting: That guy rotted himself right into a splotch on the pavement, as pumpkins are wont to do in Houston weather. So then The-Guy-Who-Knows-A-Song-About-A-Chicken went out get a new pumpkin. Only lo and behold new pumpkin turned out to be an un-carvable gourd. And so then the only logical thing for The-Guy-Who-Knows-A-Song-About-A-Chicken to do was to chop un-carvable-gourd-guy in the head with an axe. And stab him with an ice pick. Because, again, having lived in our new home all of two weeks we wanted to make sure the neighbors knew we were the friendly type. And nothing says "friendly" like an ice pick. Which brings me back to that good 'ole Pete Seeger song "If I had an ice pick (or some other implement of destruction)". Okay! So the song's about a hammer and not an ice pick. At any rate, that and a party and some trick-or-treating and more candy than any five people need was our Halloween. Happily ever after. The end. The pumpkin photos are awesomely macabre, especially with some TX heat put on that one. 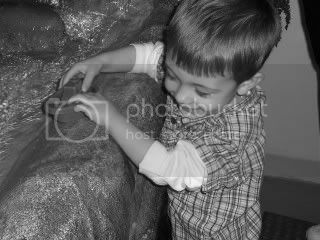 Wow I like the photos. Seems like an happily macabre time was had by all. 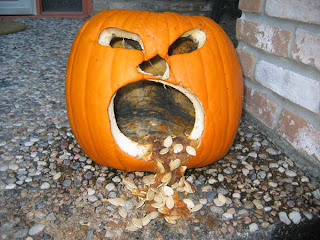 Love the puking pumpkin. Our pumpkin never got carved because we were pukingly sick, in fact it's still sitting in our kitchen. I just don't really know what to do with it. No wonder the pumpkin threw up. He's full of rotten pumpkin. That would send me over the edge, too. The vomiting pumpkin is totally scary. Very Halloween. 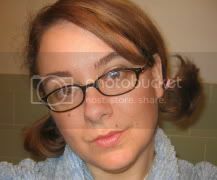 Kristine - Sorry you were sick! :-( :-( :-( I thinking trash can on the pumpkin though, unfortunately. Thanks Christine! Would you believe she went to school that day not knowing what she was going to dress as for Halloween? She thought that up & put it together in the hour and a half we were home between school & leaving for the party! Har! Your neighbors must just LURRVE you guys! (I know I would). 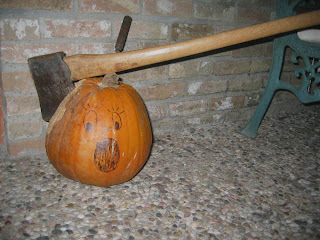 The hatchet head pumpkin - very cool. Dang, gotta get me a guy with some power tools and a good imagination. I hope you guys had a great Thanksgiving in your new house! Thanks Maureen, Ingrid & Roger! Roger I was just thinking that between everything I hadn't been over your way in quite a while!